What a delicious way to start the new year, having the honey from my garden featured in a four-course meal at Peaceful Bend Winery! The winery has a monthly supper club where local produce is featured in their wonderful meals. I have been attending the super clubs as part of my retirement “training” by my bee buddy David, who continues to claim I am not doing retirement proper justice. As a thank you to Katie and Clyde Nott, Peaceful Bend Winery owners, I gave them a couple jars of honey for Christmas. 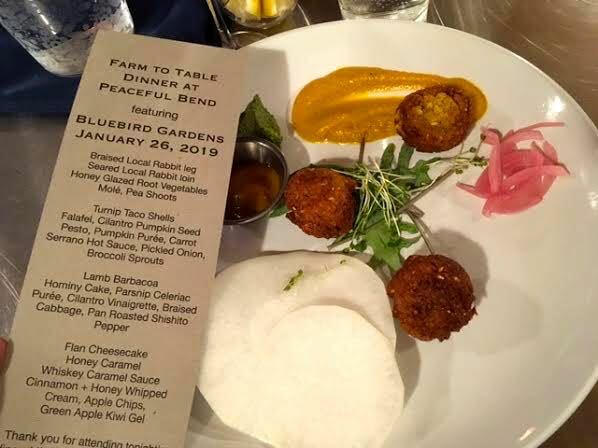 A couple of weeks later, Katie called and said August Rolufs, their chef, was interested in featuring Bluebird Gardens honey at their January 26, 2019 supper club dinner. When August addressed the group, he said the dinner was inspired by his visits to Mexico, so appropriate since I was raised in South America including Mexico City. Mere coincidence but I thought of it as a cosmic nod to the whole evening. Every course had Bluebird Gardens honey on the plate. This course was crisp and fresh with turnip taco shells, my first time eating those. The main meat course was wild and domestic rabbits from Meusch Farms, one of my favorite spring and summer Farmer’s Market sources for lettuce, spinach and other local greens. We loved the roasted vegetables seasoned with honey, and the little sprig of peas was fun - it really tasted like peas! The main course was locally-sourced lamb with a light sauce that included honey. The braised cabbage was my favorite of this dish, light and tangy, a nice contrast to the sweetness of the lamb. Desert is always a favorite and this one was another winner. The flan cheesecake reflected the traditional flavors of the classic Mexican flan with more body, and we had to double-check that the spun sugar topper did indeed include Bluebird Gardens honey. Every Peaceful Bend Super Club gives the featured product a few minutes to discuss their business. I took a few minutes to talk about the role of pollinators in our food chain and how the dinners can help keep pollinators by planting more flowers. Did you know it takes 40,000 flowers to make one teaspoon of honey? So there’s talking and there’s showing and for those who were interested in seeing my bee garden, Begonia Bee sat next to some photos and product samples, such as our honey sampler gift set. It was truly an honor to be featured and a dinner that Begonia Bee and won’t soon forget! I have been taking retirement lessons courtesy of my bee buddy David Draker, who has made it clear I don’t quite have the hang of sitting around not doing anything. 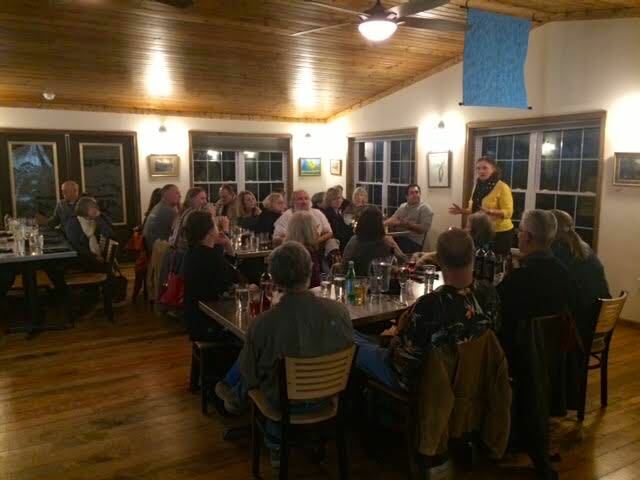 My “lessons” include joining him, his wife Gina and his wife’s best friend Ginger Schneider at Meramec Vineyards monthly wine pairing dinners, a delicious and informative evening of tasting local wines and getting ideas of how to serve them with a variety of dishes. It was a cold, rainy, overcast day for this particular November 1, 2018 wine-pairing dinner, the last one for this year. 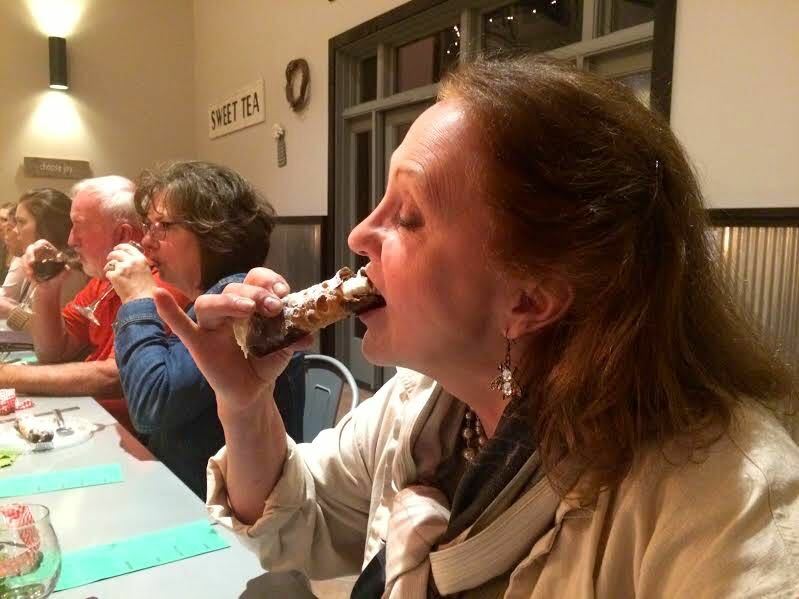 This was Ginger’s special evening since she won the drawing for a free dinner at the previous wine pairing. I also felt like I was a winner since this menu included, to my delight, a marvelous discovery; this dark chocolate cheesecake. Who said I can’t start discussing a dinner with dessert first? When I was working full time and traveling a lot, I made it a mission to try to find the best cheesecake wherever I was working. I had tried a chocolate cheesecake somewhere, decided it was not tasty and returned to sampling over flavors until tonight. This dark chocolate cheesecake made by Meramec Vineyards Owner Michelle Boulware was a scrumptious surprise in every bite, the savory dark chocolate paired with the Chambourcin sweet cherry reduction sauce a perfect balance. I splurged and added a cup of coffee, which contrasted nicely against the Chambourcin cherry topping reduction. I can’t say this is why we ended up being the last people to leave the winery - again - but it certainly was a factor in why I was lingering. I was thinking how was I going to pursue finding other dark chocolate cheesecakes since I don’t travel as much when it struck me I don’t have to go far at all to revisit this one! Our assessment during the dinner was the Chambourcin was rich and complex with “a touch of spice,” Gina said, a very interesting wine to pair with the other winter meal dishes. The staff do a very nice job of setting the tone for these special evenings. Instead of sitting at tables set up in a U-shape, this November 1, 2018 the tables were separated into small separate seatings, which was a nice intimate setting, easier to have conversation. A chef friend of mine from the East Coast used to say half of any meal is the visual, from the meal surroundings to how it is plated. I love peeking through the glass doors as we arrive to see how the room is set up for the special evening. The evening meal started out with a very interesting dish featuring a cheese I am not particularly fond of using - again another charming discovery. The baked Brie with a strawberry reduction, walnuts and figs was a surprising complex combination topped on the toasted bread. I would have been happy to have just this dish as my meal! The baked Brie was followed by a creamed mushroom soup that was thick with cooked mushroom pieces. I have yet to meet a fungus I didn’t find tasty so the generous number of mushrooms ensured several in every bite. What do we do in between courses? Usually we talk but this evening we had the added entertainment of having “Girl Scout” Ginger teach us how to tie the knot used to tie up the evening napkins. Wait. It was more like she figured it out then tried to teach the rest of us. I never did get the hang of it but David came close. Gina was smart to not even try and calmly sipped her wine as the rest of us made a mess of the pieces of string, and our own fingers! The main course was Chambourcin braised short ribs with creamy garlic mashed potatoes and a homemade roll with olive pieces that commanded my full attention. I took a photo of the dish but it was not in focus. I did catch a followup photo of the creamed mushroom soup as the staff was sitting down to their meal. These dinners include live music by William Owen on the keyboard. This particular evening some at our table were singing along, stopping only long enough to check their phones for some trivia, such as who was the first artist to sing “King of the Road.” Mr. Owen has been the live music at most of the monthly dinners we attended earlier this year and he has a wide ranging repertoire. He also takes requests. Luckily for everyone there I was not in the mood to sing or I would easily have cleared out the place, I am well-known within my family for being basically tone deaf but it doesn’t stop me from singing. My niece makes up for it, she’s been in Honors Choir and now is part of a Washington University a cappella group, the first sophomore to make the try outs. Yes, she more than makes up for her tone deaf aunt. And since I mentioned the Meramec Vineyards staff, they are a welcoming and fun group who make these evenings extra special. As new owners of the winery, Michelle and Joseph Boulware have introduced a variety of menus and outside weekly live music events during summer. They are also planning seasonal events for the holidays. Follow their adventures on their “#grapelife Behind the Vine” blog and Facebook page. Meramec Vineyards will be taking a break from offering these special $40 per person monthly wine pairing dinners through the holidays but they will be back January 17, 2019 with a Norton wine pairing dinner. I suggest you make reservations, these dinners are an excellent value and were almost sold out most of the nights we attended. In the meantime, they have a Bistro daily lunch menu I plan to carefully study, daily soups and sangrias, beer and a number of special upcoming events. Who is with me on the December 13 Ugly Christmas Sweater contest?? This was a night in Italy without taking a plane or having to go very far at all courtesy of Meramec Vineyards monthly wine pairing dinners in St. James, Mo. 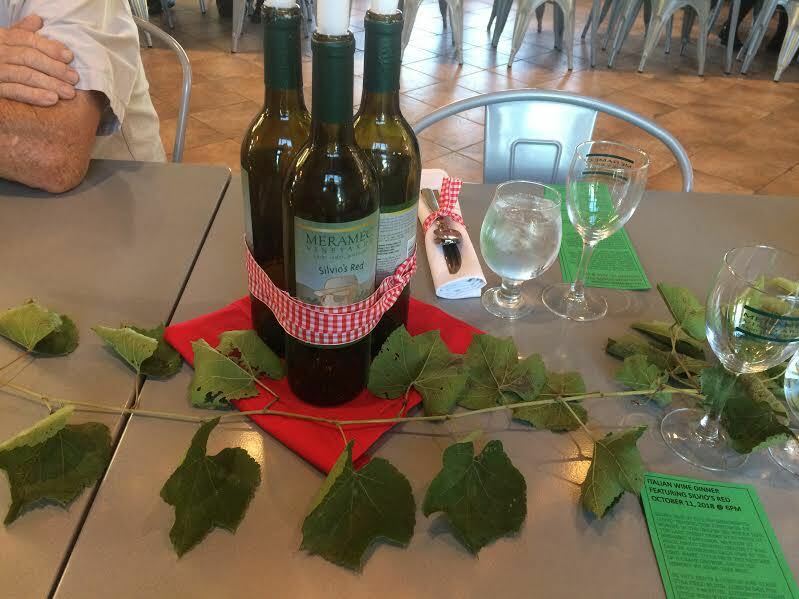 The October 11, 2018 wine-pairing meal was in honor of “Silvio,” a renown immigrant Meramec Vineyards worker for whom the starring bespoke wine was named. We had a chance to taste the wine during the dinner both at room temperature and chilled. I enjoyed Silvio’s Red both ways with a slight preference for chilled. Good to their own description, this taste of Italy kicked off the night with homemade meatballs with Silvio’s Red in the delicious red sauce. The meatballs from Wildcat Creek Meats where a meal all in themselves! The appetizer was followed by a delicious antipasto salad made with a light spicy vinaigrette that included - you guessed it, Silvio’s Red wine! I confess, I added a little more of the vinaigrette to get the full flavor of both the dressing and the salad! I usually am the one taking the photos at these dinners but this particular evening I forgot my cell phone and had to borrow my beekeeping buddy David’s phone. Since we were coordinating the meal photos, David did a good job of making sure a photo was taken of every course before I tried it. The main course featured braised Italian sausages with peppers and onions served with a crispy polenta cake. Polenta is a dish made out of a variety of ingredients, primarily traditionally coarsely-ground corn meal. And a particular mention of that homemade roll with olive pieces - nice savory touch! Desert was courtesy of Heavenly Divine Cupcakes, an enticing cream-filled, chocolate dipped cannoli that begged the question. Does one eat it with a fork or with one’s fingers? Having spent several weeks in northern Italy a couple of years ago, I remembered how Italians ate their cannoli and I did the same. The last treat of the evening, the drawing for a free meal for the next Meramec Vineyards wine-pairing dinner. And the winner was one of the members in our dinner party, Ginger Schneider! It was a nice evening with a European flair. We left a couple more empty wine bottles for their next creative table decor. The next and last wine pairing dinner for 2018 was November 1 featuring Meramec Vineyards Chambourcin. No need to wait for the next wine-pairing dinner, Meramec Vineyards offers daily specials and family friendly Sunday brunches, no frequent flyer miles required! Guests September 20, 2018 were greeted with these lovely table scapes of apples and candles. This particular evening it was all about apples and pears, the two fruits that provide Meramec Vineyard’s Chardonel its special notes. I prefer my wines on the red and dry side but the two bottles I took home argued that maybe I had quickly developed a fondness for this lovely white. Meramec Vineyards Chardonel is a delightful refreshing match to pork medallions. 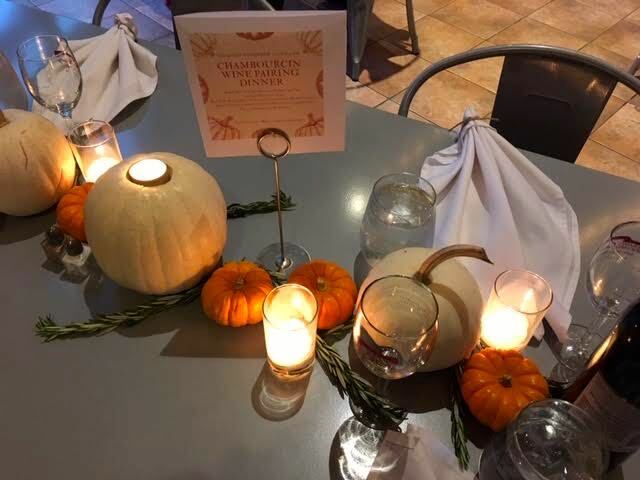 As we have become to expect, Michelle Boulware, one of the “new” owners, went out of her way to set the stage for the pairing dinner with lovely table scapes. This evening, pieces of hand cut wood served as trays for a pile of candles and apples of all sizes, including charming 1-inch ones that came from Michelle’s back yard. She warned us not to eat them, they were bitter. We took a closer look, passed on taking a bite and all agreed those tiny apples were till very cute! The evening kicked off with a french onion soup that reminded me of Famous Barr in St. Louis, which used to have a restaurant with a great french onion soup. Anybody remember that soup? How about the store. We used to make a day of it to shop, having lunch, then make a leisurely trip home. I’m starting to sound like my mother. 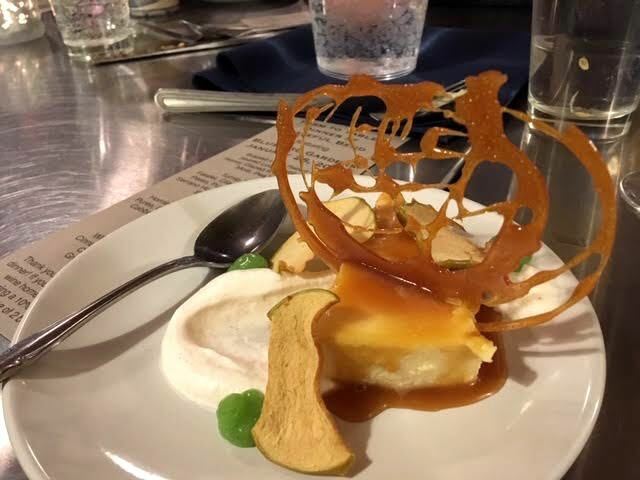 Meramec Vineyards french onion soup kicked off their apple-themed dinner. After french onion soup, Meramec Vineyards offered lovely salad with fresh greens and apple and pear pieces. I though the colors really made the salad come alive! The homemade salad dressing was made with - you guessed it, the Chardonel. Those table scape apples almost don’t look real, do they. It’s the candlelight! The main course was pork medallions on pasta, a nice combination with an apple-based dry wine. Pork medallions in pasta was a great main course with the white wine with fruity undertones. Dessert. An apple crisp topped with ice cream, perfect ending to a trip through apple land. Michelle kept mentioning the table decor one of her assistants had put together but I didn’t get to see it until we were leaving. This could be a spot in my garden, I am always knocking a bucket with flowers over as I walk by. Another part of the apple-themed table scape with local wildflowers. Two-fisted drinker? Sort of, I was treated to a preview of Silvio’s red wine. 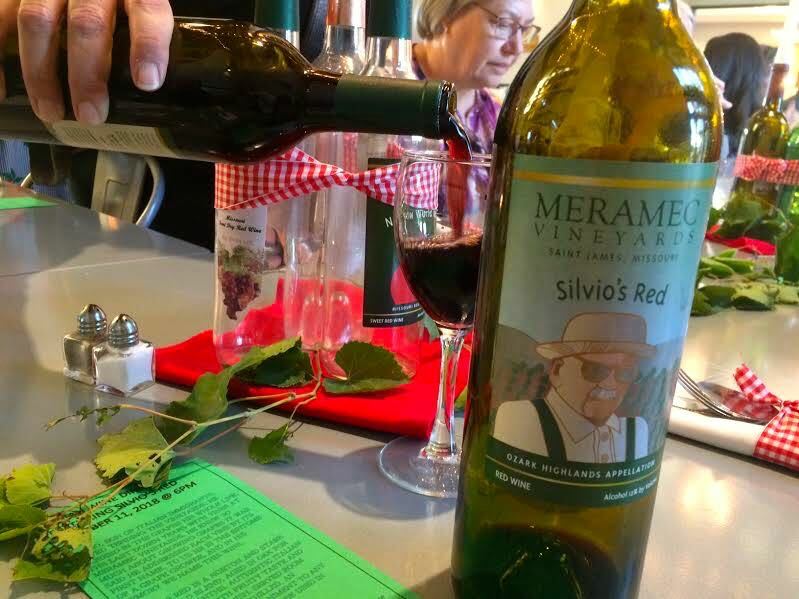 Meramec Vineyards Silvio’s Red has a special story all of its own. It’s one of their signature wines and the star of their next pairing dinner scheduled for Thursday, October 11. You will find the upcoming pairing dinner menu and other events on their website. Ok, so who knows the story behind this Silvio person?! Oh, my, did this sign bring back memories but I'm not telling! Did your family have any traditions when you were growing up about dinner? We did. Whoever was home first set the table. Whoever was home last did the dishes, the one next to home last dried. We had a dishwasher but Mom liked having the kitchen clean after dinner so it was our job to get everything clean and put away before the lights were turned off. There was no TV in the dining room - can you even imagine? We would have conversations about what happened in our day, what might happen tomorrow, and over the weekend. There were no cell phones on the table, and if the phone rang, no one answered. We were having dinner and the phone was not allowed to interrupt the time we set aside to be together. After the table was set, we were all expected to stay close so that when Mom said "dinner was ready," everyone would settle around the table for a warm meal. Nothing out of the microwave, this was a warm dish out of the oven, or from the top of the stove, cooked from a recipe out of a favorite recipe book or a favorite recipe card kept in a recipe book. If there was some sort of bread, and a vegetable dish, it would be timed so that all three were served warm at the same time, quite a feat when I think about that today, not to mention desert. When I became a stepmom and was coordinating my own home-cooked meals, I remember taking cues from her dinners including freezing meals ahead. I never did quite get the "hang" of repeatedly following recipes but then I didn't set the kitchen on fire, either. I found them at - what else - a local thrift shop. They are ceramic; the purple pansy is the smallest measuring 1/4 teaspoon, to the largest, a red poppy measuring one tablespoon. Like most good non-precise cooks, I don't usually use measuring spoons. My idea of measuring is several guessing shakes, a few pinches or a couple of dabs. One year my mother did give me one of those sets of plastic measuring spoons that takes up space in a drawer but I can't remember the last time I used them. They are currently hanging from the side of a cabinet where I can see them. When I have a recipe that requires several measurements, I take them down and use them, more for the fun of it than for the measuring precision. I am sure it helps to increase the chance the dish will not only come out edible but can also be more easily replicated, something my mother would have appreciated. She never ceased to ask about a dish she liked only to find out I couldn't give her the recipe because I had just thrown it together earlier that evening and couldn't replicate it even when I tried. A number of times. Doing a little research online, I didn't find this set but I found a similar one, featuring all red flowers, made in England. That makes sense since even the smallest British homes have their postage stamp gardens carefully planted with fresh herbs and cutting flowers. Mom taught me to collect what I like. It's easy to get caught up in trying to invest in collectibles but something is only as valuable as what someone is willing to pay. Life is complicated enough as it is so I simplify by picking up things I like, and then use them. If you want to get someone on the right path cooking, a good basic recipe book like the American Cooking Illustrated Encyclopedia is a good start. But so is a set of measuring spoons that speaks to them. Even if they don't use them, they will have something they can hang as home decor on their kitchen walls as a fun reminder of you. Isn't this adorable? It is a gift from a dear friend who has a cat named after her. I had a late Christmas with a dear friend in January. She's dear enough that my 19-year old cat is named after her. Although she is allergic to cats, this friend loves to visit and check up on her name sake and Margaret, the cat, seems to know they have a special bond. So it's no surprise that one of my gifts this year starred a white cat with a pink nose, this darling cat fishing tea infuser. So the Meow Tea Cup infuser features a fish tea infuser that holds the loose tea. Tea infusers are used to brew loose tea leaves. They are also called tea balls and tea eggs. There are a number of different tea infusers on the market that, over the years, I have also used to add herbs to soups. I have a couple tea infusers that I use with my dried herbs when I make tea but this one is the highest on the adorable meter. First I should tell you that one of my cat's favorite games is to chase a fishing line on a fishing pole with a catnip toy at the end. It's a great way to practice my casting and keep my cats exercised. I don't recommend casting this fish tea infuser but it reminds me of those cat fishing games my little feline friends like so much. Here's the tea infuser taking a dive into a cup of hot water. Once filled, the fish tea infuser goes into my cup of hot water, supervised by a little white cat holding on to the edge of the cup. And the little white cat holds on to the tea infuser chain until it's ready to be retrieved. So much like the spirit of my cat Margaret, who also takes her supervision duties seriously and infrequently leaves me to my own devices. Not that she is a lot of help but she does think my days go better if she's close by. And they do. I really like this gift to add to my breaks with Margaret the cat in my lap. Now I have yet another reason to slow down and enjoy the day. My Christmas tree story this year includes fruits, cats, birds and Mr. Santa Mouse ornaments. When visiting friends and relatives, I enjoy looking at their Christmas tree and matching their holiday traditions to their personalities. Some have very formal Christmas trees, others have the more old-fashioned decor with favorite ornaments on their trees. Regardless of whether it's a real or artificial Christmas Tree, the best part are the stories that go with them. Since this is my foray into having something more than a miniature artificial tree, it was telling that once I had ornaments I had collected over the years on my small artificial tree, there was a definite food theme. My 5-foot artificial Christmas tree now is covered in food-related ornaments. Barlett pears, or any other kind of pears, are one of my all-time favorite fruits. I have a semi-dwarf pear tree right off my driveway that keeps me nicely supplied. These gold-toned pear ornaments were this year's addition, a 50 cent each find at a local thrift store. Perfect to add to the delicious story my Christmas tree was already telling! Beaded apples were purchased more than two decades ago at a home decor store sale. The pears joined my beaded apple ornaments, purchased more than 20 years ago at a home decor store sale. I needed to decorate a Christmas tree display for a local antique store outlet. I liked their added texture from the beading and, when I don't have my glasses on, I can almost imagine them as giant raspberries, another favorite food of mine. Most of the beaded apples were sold with another decorated tree; these were the left-overs. Fake cherry garland adds a nice pop of red in my Christmas tree. My little compact cherry trees haven't provided me any fruit yet but I am still hopeful my bees will help with pollination and get them going. In the meantime, this little red garland is a tribute to their presence in my garden. The artificial cherry garland also reminds me of the year I decided to decorate an outside cedar with popcorn garland. After getting my stepchildren to help with popcorn sampling, we had a nice handmade garland to wrap around the little cedar. The next morning, I looked out the window at the cedar tree just in time to see my wild turkeys carrying off the popcorn garland! Fabric strawberry pincushions add a touch of family heritage to my Christmas tree. As I was decorating, I remembered I had some fabric strawberries I could add. They were sold as pincushions but I thought they would make charming Christmas tree decorations. Since our family on my father's side were Hungarian strawberry farmers, the strawberries add a dash of heritage to the Christmas tree. I carefully considered whether those fabric strawberry ornaments would be too tempting to may cats and decided to add them anyway. They are at the top, where little paws can't easily get to them. I also added my little collection of gift cat ornaments from former office colleagues and a few white mushroom birds picked up for 10 cents at another thrift store. I have a family of doves that winter over in my garden, the white ones in the tree remind me of their presence. There are also several fabric bird ornaments made out of old quilts, those have been collected individually over the years. And another old friend is Santa Mouse, who has sat on top of my Christmas trees for many years. He's venturing a little lower this year because I have a flying angel chasing a bee at the top, a nod to my new passion with beekeeping. Yes, I also wonder how long it will take before the cats get Mr. Santa Mouse out of the tree! A friend has a neighbor with an old Bartlett pear tree, notice all of the pears are at the top?? When I used to dream about adding fruit trees to my garden, having a pear tree was top of the list. Now I do have a semi-dwarf Bartlett pear tree that's several decades old and just recently has started to provide fruit. This year, my Bartlett pear tree gave me only one pear but that doesn't mean I won't have fresh pears this year. A friend with a neighbor with a traditional Bartlett pear tree invited me over to pick pears and I was not going to turn down the opportunity. The first thing we notices was that the remaining pears were out of reach at the top of the tree. My friend said you would think wind would knock over those pears. Not to be daunted, we started to pick through pears already on the ground. Contrary to popular belief, those pears on the ground are fine, even with a little damaged corner. These pears are grown without any pesticides so there may be a few little spots that need to be cut off. Use a knife, clear out the area and enjoy. Also don't be afraid to pick up more than you can use, pears make wonderful gifts. Once I had my stash, I stopped by a local thrift store and picked up a basket and two napkins to use as a basket liner. Once the pears are gone, the napkins can be re-used when setting a table for meals. I selected a variety of pears, from ready to eat to still a little green, and dropped the basket off with a friend who recently had surgery. He was thrilled, the first thing he said was "oh, good, something soft I can eat." Locally-grown pears in a napkin-lined gift basket ready to be delivered. A variety of pears, some ready to eat, others still green, are a good variety. For those still green pears, you could add a little brown bag with instructions to add a pear and an apple. The apple will give off a gas that will help ripen the pear. So glad I kept a few for myself as well, fresh pears are wonderful just as they are! Getting ready to enjoy a Baked Blessings by Jane lemon scone with a cup of hot green tea. Saturdays are days to relax and to head to my local farmer's market, preferably to pick up something scrumptious for breakfast. Not that I always do, sometimes I pick up the prevailing produce and head back home to start my day but not today. I found a vendor at the end of the aisle offering free homemade scone samples to try. If you ever wondered if offering samples works, it does. These scones were moist and not too sweet, a perfect counterpoint to the icing and the cup of green tea that was waiting for me back home. Scones are not hard to make, our family has been making them for breakfast for years. There is something special, however, about buying one that was freshly-made and which does not require me to mess up my recently-cleaned kitchen. A variety of scone choices offered by baked blessings by jane at rolla's downtown farmers market august 13, 2016. I only had $2 in cash in my purse so I settled on a favorite-lemon. This is a "lemon zest with glaze and almonds," a scone that didn't quite make it home all in one piece because I kept nibbling on the corners. Yes, I can taste the lemon zest I decided at one stop light. No, the glaze is not too sweet, was the verdict at another stop. It was also interesting to hear stories about Jane's grandfather who used to keep bees. He had 75 colonies at one time and sold honey at area locations. Spending time at farmer's markets is nothing new to Jane. Oh, there is a real Jane. Meet Jane! Time to finish my cup of tea and decide what to do today. That's right, it's Saturday. Time to relax! Laura at August 2, 2016 Rolla Farmer's Market, just after her ribbon haul from Phelps County Fair. Over the years, I have toyed with the idea of entering something into the local county fair contest. I have been a judge at fairs, and since then have enjoyed seeing winning entries when I was visiting communities with fairs. I can honestly say I have never met someone with so many blue ribbons! I didn't catch her last name but her first name is Laura. She was talking to a couple of customers when I stopped by so I took the time to look at what all had won the coveted blue ribbons. There were the standard salsas, pickles, relish and jams next to the unusual pickled eggs and pineapple salsa. Some of the award-winning canned fare Laura won at the 2016 Phelps County Fair. After carefully perusing each and every jar, I selected a jar of her mild salsa. I like to use salsa on my summer salads, I told her. Most definitely, she said. And do you add onions to your scrambled eggs? Of course, I said, along with green peppers and tomatoes at the end to add color. Don't forget the mushrooms, Laura said. More of Laura's award-winning jars from the 2016 Phelps County Fair. Did I forget to mention the cute floral hat she was wearing? Hard to miss, channeling comedian Minnie Pearl even with a price tag on the side. Not sure if it's polite to ask for a favorite recipe or not but it did cross my mine. I may have to try some more of her jars. The pineapple relish looks interesting!